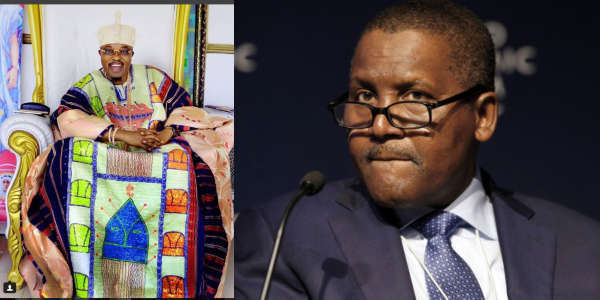 Oluwo of Iwo who made headlines few months ago after he dumped the Oba title for the Emir title, has disclosed that he is richer than Africa’s richest man, Aliko Dangote. The Oluwo of Iwo had before now, been accused of concealing from the state government some facts about his past. It may be recalled that the Oluwo of Iwo-Oke, Oba Kadiri Adeoye accused Oba Akanbi of faking his name to obtain travel documents to the United States where he was jailed in New York City and was deported to Nigeria in 2000. The affidavit also stated that Oba Akanbi later traveled out with his real name to Canada in 2001 and became a Canadian citizen, but was also arrested in Toronto and was in jail between 2006 and 2007. Oba Adeoye added that Oba Akanbi was making money through Internet fraud or ‘Yahoo-Yahoo,’ as it is called in local parlance, using his palace as a cover-up. However the Oluwo of Iwo, in reaction to the allegations in a 13-paragraph affidavit, described the application filed against him as “scandalous, vexatious and designed to embarrass, blackmail and ridicule” him in the eye of right thinking members of the society, vowing to take up the case to a higher court in the land. 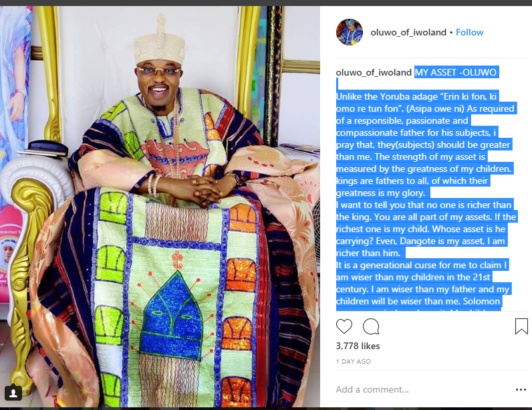 0 Response to "I Am Richer Than Dangote – Oluwo Of Iwo"